Any pizza, any crust, any toppings, just $10? REALLY? But wait! Is that fine print at the bottom? Yes, it is! And what does it say? 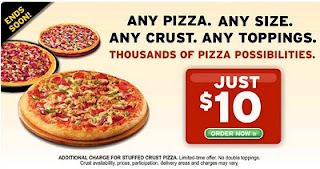 "ADDITIONAL CHARGE FOR STUFFED CRUST PIZZA"
Now, I must admit: $10 for a pizza that is loaded up with a bunch of stuff is a good deal (unless you simply won't buy food at a place like Pizza Hut because it will also be loaded up with high fructose corn syrup and other "food products"). That's not what bothers me. What really bothers me is the blatant manipulation and assumption that we are all rather dumb. They come up with a marketing line that is very powerful - but a lie. It's not "any pizza, any crust". Why oh why can't everyone be as logical and straightforward and honest as a software programmer? I get kind of sad sometimes, watching people disappear into their mobile distraction devices. iPhones and their like certainly offer new opportunities for community and entertainment, but mostly it seems to me that they lead to isolation in one's physical context (aka, the real world) and lack of introspection. Basta would allow you to request disabling of specific features of your iPhone (or all of it, just turn it into a black slate) for a given period of time. Basta makes it easy for you to answer questions like: "Can I go 10 seconds without reading/writing texts?" But the really exciting, Web 2.0 feature of Basta is that your friends (via Facebook, etc.) can challenge you to specific Basta restrictions: "I bet Steven can't go more than an hour without sending a tweet." and so on. All dares - proposed, accepted, denied and the results - are posted to your Facebook page and can be seen by others. So you can build reputation and status around your ability, willingness, discipline to step away from devices and instead interact more with real live, breathing humans. Or just watch more TV. Anyway, that's my idea of a really great app! 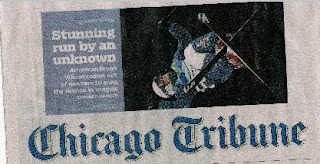 It says "Stunning run by an unknown - American Byron Wilson comes out of nowhere to snag the bronze in moguls." What I find so odd about this is the idea that any of the athletes who are competing in the Olympics could be "unknown." You only get to the Olympics if you are the best of the best, verified through a multitude of contests. In fact, Wilson won the U.S. Championship in 2009 to secure his spot on the "B" OIlympics team, and was a former Junior World Champion. The only way that any of these Olympic-quality athletes could be considered "unknown" is by the Tribune deciding that they weren't worth "knowing" - until they won a medal. On January 13, we buried my father, Sheldon Feuerstein. On January 25, we buried my sister, Laurie Feuerstein Walsh. It has been a horrible couple of months (December and January). I can only hope that the rest of 2010 is better for all of us. I feel very strongly that both Dad and Laurie had health problems contributing to their deaths that came from the foods they ate and the toxic environments in which they, we all, lived (any urban environment saturates us with toxins). Those same foods are likely causing problems for the rest of us, too. I have lately been struck by how ridiculous it is that food has become such a complicated and treacherous affair, that we seem to need nutritionists and scientists and politicians to decide what is good for us to eat. Isn't that strange? Humans have been finding, growing, preparing and eating food for thousands of years - and surviving quite well, thank you - without all this "assistance." And in the US, where the nutritionists reign supreme, we are getting fatter and sicker with each year. Something is so deeply wrong with this picture. Fortunately, I think the solution to this problem is very simple: "Eat Food. Not too much. Mostly plants." That is the mantra of a man named Michael Pollan. He has just published a book called Food Rules, which I urge you to purchase and read immediately (only $5 from Amazon!). This small, very accessible book offers simple, practical advice regarding food that can help all of us regain control of our bodies and our health. Here is what I have decided so far from reading this book: I am going to stop purchasing packed, processed food products (not the same as food) as much as possible. No more Ritz crackers (absolutely yummy with PBJ), no more ramen noodles (I love those with a generous helping of sauteed brussel sprouts). NO MORE HIGH FRUCTOSE CORN SYRUP at all. I will check every package. I am now convinced more than ever that that stuff is a poison (or at the very least a drug) that operates at a very deep level on our physiology, making us fat and sick. If you are sick or you have a family member who is sick; if you are affected by any of the four "Western diseases" (obesity, high blood pressure, diabetes or cancer); if you simply don't feel all that great (low energy, acid reflux, etc.) - then please, please, take a serious look at a serious change to your diet. It could make all the difference.